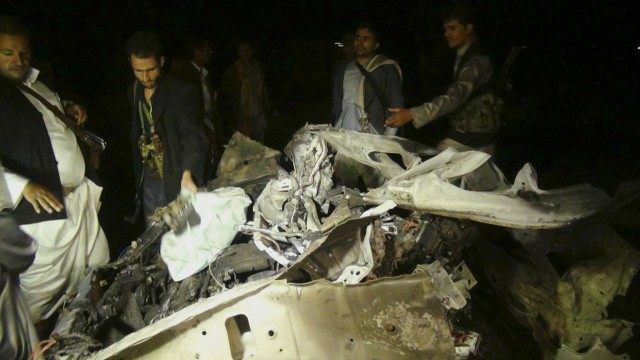 Car bombs killed or injured at least 50 people near mosques and the headquarters of Yemen’s dominant Houthi group in Sanaa on Wednesday, in coordinated attacks claimed by Islamic State. The four blasts rocked the capital as Saudi-led forces conducted more air strikes against Houthi military bases across Yemen and Houthi delegates attending peace talks in Switzerland reported the first tentative progress on the second day of a U.N.-sponsored push for a Ramadan truce. A security official said at least 50 people were killed or wounded in the attacks on the Hashush mosque, the Kibsi mosque, the al-Qubah al-Khadra mosque and the political bureau of the Ansarullah movement of the Houthis, who belong to the Zaydi sect of Shi’ite Islam. “The explosion was so loud I thought it was caused by an air strike,” said a man in his 70s named Ali, who had just left a mosque when a bomb went off. The Sunni Muslim Islamic State said in a statement posted online it carried out the attacks. “The soldiers of the Islamic State in Yemen, in a wave of military operations as revenge for the Muslims against the Houthi apostates, (detonated) four car bombs near the centers of Houthi apostasy,” it said. The attack is the most serious of its kind in Yemen since suicide bombers killed at least 137 worshippers and wounded hundreds during Friday prayers at two mosques in Sanaa on March 20, in attacks also claimed by Islamic State. The Houthi-controlled state news agency quoted an official blaming Islamic State for the latest bombings. Supporters of Islamic State exchanged celebratory messages on social media. Islamic State has recently stepped up its operations in Yemen, where Al Qaeda in the Arabian Peninsula (AQAP), also Sunni Islamist, had long dominated the militant scene. AQAP recently suffered a serious blow when a U.S. drone strike killed its leader, Nasser al-Wuhayshi.